It is now two weeks since it was announced that a number of objects were missing from the Egyptian Museum in Cairo, and a month has passed since the actual break in when the objects taken. However, even though an official list of missing items was released, because of a lack of photos, inventory numbers, or detailed information, we still don’t actually know precisely what’s missing. It is possible that this information could be valuable in stopping the objects from leaving the country or being sold. Since the break in, museum staff have been working very hard under difficult circumstances trying to assess the situation, repair broken objects, and search for those that are still missing and I certainly applaud and appreciate their efforts. The museum has now reopened and many of the objects that were damaged are back on display. Dr. Hawass has stated that even the terribly damaged wooden statue of Tutankhamun on a panther has been restored, and press videos show that the Mesehti models from Asyut and the cartonnage of Tujya have also been repaired and are back in their cases. Several of the missing objects have been miraculously recovered, including the Akhenaten masterpiece. I hope that soon there may be time to release more detailed information and photos of the objects that are missing. As of yet, the statue of Nefertiti that was stolen has still not been identified and we are not sure which Amarna princess head is missing. I have been checking a number of publications for information about these pieces and have still found nothing. The majority of the Amarna princess heads are made of quartzite rather than sandstone, as listed on the inventory of missing items. It doesn’t help though that Borchardt, the probable excavator of the piece, identifies many of the heads as sandstone, though they are now acknowledged to be quartzite. I haven’t been able to find a copy of the original publication that *may* contain this statue in either Oxford or London, so if anyone has access to Ludwig Borchardt’s Ausgrabungen in Tell el Amarna 1912/13 in Mitteilungen der Deutschen Orient-Gesellschaft 52, 1913, it would be great if you could check it out! I understand that the assessment of the collection at the museum is still ongoing and there are also many positive results of recent days to focus on, but if there is a chance that information and photographs of the missing objects could help their recovery, I hope that they can be made available in the near future. The museum’s collections management and documentation team continues to work with the curators to complete their inventory, so that we can finalize the list of missing objects and concentrate on getting everything back as soon as possible. Unfortunately, there are people saying things that are untrue, and trying to make trouble, and sometimes the media likes to repeat these stories, because they think this will interest the general public. I prefer to ignore these people, and focus on our work. There is much to do to protect our monuments, and this is now, as it has always been, my first priority. There has been a lot of varied discussion recently about how to assess the antiquities situation in Egypt and what measures might be taken recover and prevent the trade of looted items. With a number of items still missing and sporadic looting attempts continuing, it is certainly worth discussing these issues to consider potential courses of action and ways in which people might help. An article by Dr. Declan Butler in the journal Nature addressed some of these questions. RÃ¼hli hopes that Egypt will call on external experts to form an international mission to assess the damage, and decide what restoration is needed. Such a mission could also assess the security at sites, and how this might be improved. Jan HladÃ­k, a specialist in cultural heritage at the United Nations Educational, Scientific and Cultural Organization (UNESCO), notes there was a similar UNESCO mission during the Iraq War, in 2003. Researchers have also called on law-enforcement agencies and art dealers around the world to look out for stolen Egyptian antiquities. Rick St. Hilaire, a cultural heritage lawyer, has discussed the possibility of implementing legislation in the United States to protect against objects being imported, enacting an Emergency Protection for Egyptian Cultural Antiquities Act. He also offers practical advice on who to contact for anyone who encounters a potentially looted object or has suspicions. I would be very interested to learn more about possible legislative avenues outside the US as well. There has been some defensive backlash against such legislation from collectors in America, who have accused archaeologists of using the looting in Egypt to try to strengthen restrictions on the import of Egyptian artefacts ‘far and beyond the scope of authority vested under U.S. law’, however this response seems rather reactionary and self-interested. The welfare of the Egyptian people are to be considered first while we continue to monitor cultural property issues. One issue that requires attention is obtaining reliable information. The lack of credible information regarding the theft or looting of cultural objects in Egypt requires resolution, especially since many cultural organizations have called on law enforcement to remain alert. Authorities at the US border cannot be expected to be on heightened alert when there is conflicting information about the extent of looting at archaeological sites or thefts from museums. Egyptians involved with cultural heritage, aided by journalists on the ground, should investigate the extent of damage to cultural heritage in Egypt. Only then can American authorities provide appropriate assistance. The most effective way of protecting against trade and looting of antiquities is on the ground, through assessment and heightened security. The employees of the new Ministry of Antiquities and the Egyptian people have made an enormous effort to this effect, and the world owes them a debt of gratitude. Again, Egypt has already managed to recover a number of items that were taken from various sites, but presumably assessments are still taking place of what is gone and what damage has been done. Hopefully if any of the archaeologists who work at the sites in question can be of any assistance they will be included in the process. If the revolution will truly be bringing a return of power to the people of Egypt then perhaps one of the issues to address is the role of the media. The Egyptian media should be given the exclusive right to be the voice of the antiquities service (in whatever form it will eventually become) rather than hand-picking selected non-Egyptian media outlets for such announcements. There are a lot of potential avenues that could be taken to try to protect sites and objects both now and in the future, and hopefully Egypt, other governments and international organisations, and Egyptologists can also contribute to this dialogue and future course of action. If you have suggestions, please add your contribution to the comments below! In other news, a recent statement by Dr. Hawass addressed the subject of protests outside the Ministry of Antiquities, stating that a number of the protestors had apologised and brought flowers and planned job creation would open up 900 new positions in the ministry. 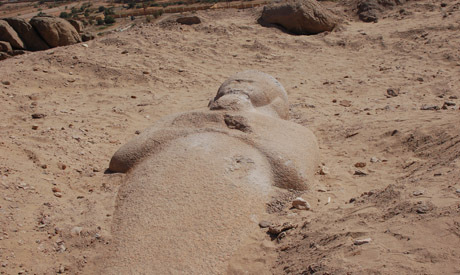 Ahram Online reports that security guards and archaeologists managed to thwart an attempt by a gang of thieves to break up and steal a colossal red granite statue of Ramses II from a quarry in Aswan. There have also been reports from the US Copts association (via Kate) and on the Facebook Restore + Save group of Coptic monasteries being attacked by the army. In more positive news, there has been a proposal that the burned out National Democrative Party headquarters beside the Egyptian Museum in Cairo be turned into a public garden. It has previously been cited as a potential risk to the museum because of the structural damage it has suffered. In an interview with the New York Times, Dr. Zahi Hawass, Egypt’s Minister of Antiquities said ‘that his department was unable to protect Egyptâ€™s historic sites and artifacts and that he was considering resigning. In a telephone interview he said that thieves on Monday broke into two warehouses near the pyramids of Giza that held artifacts excavated in the early 20th century. It was not yet clear what had been taken’. He also stated that ‘people had also been caught excavating at night at Abydos, an important archaeological site north of Luxor’. For further accounts of the break ins at Giza, see the following articles at Al Masry Al Youm and Bloomberg.com. Also, in an interview with the Prague Post, Miroslav Barta discusses the possible break in at the Czech storehouse at Abusir. If you found the post below on Gurna interesting, there are some notable new articles about the situation. 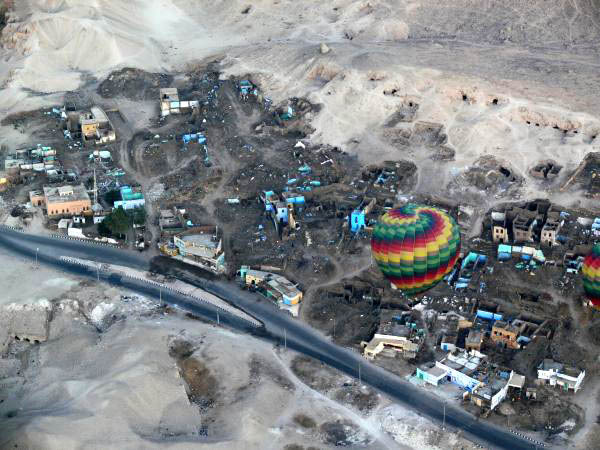 â€˜Egypt Todayâ€™ notes the benefits and problems of the relocation scheme, with the prospect of the re-discovery of ancient tombs, but also the inadequate housing situation for former residents, some of whom are temporarily homeless. Also from ‘Egypt Today’, a beautifully poignant article about the culture and history that will be lost in Gurna and a rather more triumphant report by the Egyptian government about President Mubarak inaugurating the new town, supposedly being greeted by ‘by cheering crowds grateful for being offered the chance to lead a new life at a new place that addresses all their needs.’…. Meanwhile, the Egyptian Tourism Minister has stated that touts are a bigger threat than bombs to Egyptian tourism. While many people I meet labour under the misconception that there is very little left in Egypt to discover (though not for long, after Iâ€™ve gotten hold of them! ), the reality of the situation is clear to anyone who has travelled in Egypt itself. The landscape is littered with monuments and the debris of millennia of civilization. While much of this is not quite as obvious as the Great Pyramid, remaining hidden in the desert sands or beneath modern city streets, everywhere the ruins of ancient Egypt are inescapable. At many sites, like Saqqara, the location of the first step pyramid, you cannot take a step without standing on crushed pottery sherds or broken limestone building blocks thousands of years old. In fact, the map of archaeological sites that I will discuss below lists, for example, approximately 125 sites within the Ash-Sharqiyyah governate alone! The problem with Egyptian archaeology is not trying to find anything left, but rather trying to deal with the overwhelming amount of material out there. 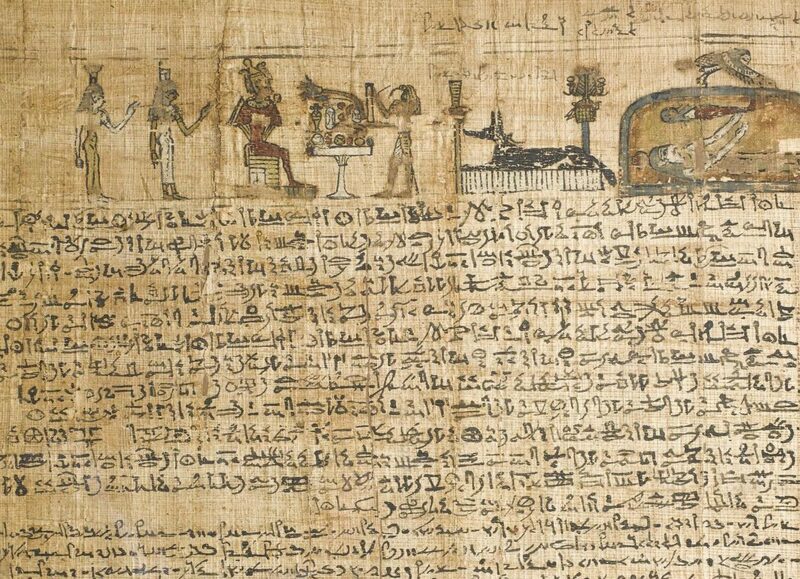 In reality, there is simply more ancient Egypt than modern Egypt can really handle. Not to disparage Egyptâ€™s efforts, since caring for such a rich cultural legacy would present a daunting prospect for any country, but their political and economic situation undoubtedly make it much more of a challenge. I recently had the pleasure to hear an excellent talk related to this subject given by Penelope Wilson of Durham University discussing some of the issues raised by the way sites are dealt with by the Egyptians, under the auspices of the SCA (Supreme Council of Antiquities). It was given in Oxford as one of a number of research seminars offered by the departments of Egyptology and the Ancient Near East and held at the Oriental Institute. These seminars allow academics and doctorate students to present and discuss their latest research with their peers and also offer the delightful prospect of tea afterwards. Penny Wilson of Sais excavation fame presented one of the recent sessions, entitled â€˜Defining Delta Sitesâ€™. I have had many opportunities to hear countless Egyptologistsâ€™ speak about the archaeological process in their own work, but it was fascinating to instead hear an Egyptologistâ€™s take on the current general situation and her greater philosophy on how we approach identifying, investigating, and preserving archaeological sites. Her thoughts were presented partially as a reaction to the â€˜Historical Sites of Egyptâ€™ being produced by the Egyptian Antiquities Information System, the GIS department of the SCA (strangely enough in conjunction with the Finnish Government for some reason). The map and catalogue of information as it stands so far is fairly impressive considering the monumentality of the task. The identification and assessment of the sites though is focused around land ownership and sites are variously categorized as either property of the SCA, under SCA supervision, under registration request (some as far back as the 90s), or site under research. One of the problematic aspects of this system is that it doesnâ€™t distinguish between more or less substantial sites, or between different eras, lumping together a Ramesside temple in with a site with a vague scattering of Roman pottery. Another negative aspect of a site identification system based on land ownership is that land that has been sold off and no longer belongs to the SCA is not included. Theoretically, this shouldnâ€™t be a problem since the SCA is only supposed to sell off land that has been deemed unfruitful in preliminary excavation. However, the reality that Professor Wilson accidentally discovered when surveying at one of these sites was that SCA had done a trench survey there and had declared the site devoid of interest despite having turned up very obvious evidence of ancient settlement! Wilson then turned her attention to the famous site of Merimde Beni Salame, which lent its name to a phase of Neolitic Egyptian culture, and managed to elicit gasps from the audience by her announcement that the site has been reduced to a small desert strip, the rest having been sold off for agriculture. Wilson commented that although the SCA will send out representatives if any archaeological remains turn up during construction work, it is unfortunate that there are not SCA officers on the ground who could do assessments as foundations were being dug. In fact, during the much-publicized building of the reconstructed Sphinx Avenue in Luxor that is ongoing now, several sphinx statues have been uncovered, but only when bulldozers have plowed through the site rather than through proper excavation before the construction work. Having worked on an excavation in the Delta myself, I can attest that while the intentions of the SCA employees that we worked with were good, their training and knowledge was lacking and impaired their performance. Even with sites wrongly left off of the map, there is still an immense number that have been identified, which raises the question how much of it do we bother with? Archaeology has to believe in its own paramount importance to justify its work, but the fact is that when there is just so much of it all, one canâ€™t hold everything sacred. Some sites can be seen as representative of general cultural trends. It is always best to have a number of examples, but there is little need for evidence to be duplicated again and again. One priority that archaeologists need to focus on just as much as excavating new sites, is preserving what we already have. Although she catalogued numerous concerns with the SCAâ€™s handling of Delta sites, Wilson pragmatically recognized that with an excess of more sites than there are excavators or resources that could handle them, or would even want to, it is perhaps better to resign oneself to letting some of them go for now. While it goes against archaeological principles, I fully agree that practicality must be considered alongside idealism. If the sites have waited for thousands of years, they can probably wait a few more.